Wrap for You: Gift Wrapping Trends for Christmas! Gift Wrapping Trends for Christmas! I've already seen some groaning on Facebook over the fact that some retailers are already stocking Christmas sweets and chocolates! It does seem to be a bit earlier than usual this year but in the gift wrapping space, the earlier the better as there is a bit of planning to do if you're as enthusiastic about Christmas gift wrapping as I am! Don't wait until all the retailers have put up their prices to hunt for little embellishments and pretty ribbons. The time is perfect to start scouting for bits and pieces now. 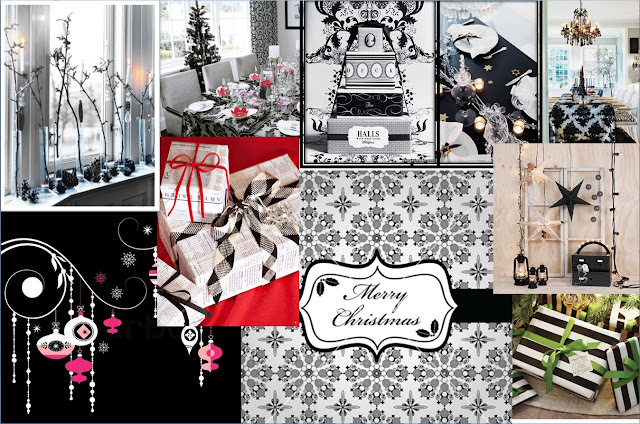 In order to assist you though and give you some inspiration, I thought I'd share with you, some of the predicted Christmas theme trends for 2013. Credit is given to Beyond the Gromet for the use of their 4 Trend Boards. Some of the predicted themes are a bit 'done and dusted' in my opinion. They've been around for the last 4 years or so and I just can't seem to bring myself to get overly excited about them, so right at the bottom, I've decided to share MY preferences for Christmas Trends for 2013. Some of you will love them and some of you will hate them but I'm going to be introducing one of the themes into my gift wrapping classes from October onwards! By the time I'm finished with you, you're going to see exactly where I'm coming from and why I'm so enthusiastic about my Christmas theme for 2013. First up is White Hot Wonderland! I just don't believe that these cool, wintry shades of gold and pewter work in South Africa. We have such glorious, warm Christmases that I love to rather celebrate with a splash of colour. But they certainly are very pretty! Next up we have Silent Night Life! I must say that I love the pretty shades of pink, plum and peach in the bottom right quadrant. But being an African, I'm a tad tired of the animal print theme and purple trended last Christmas. 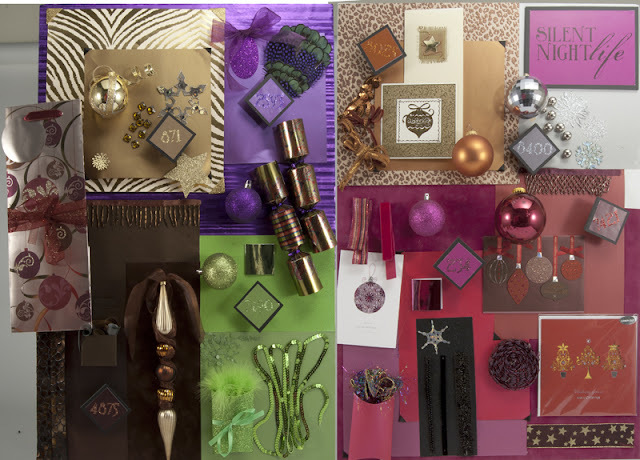 Brown and copper can be rather drab at Christmas time so I'm not completely sold on those colours either. 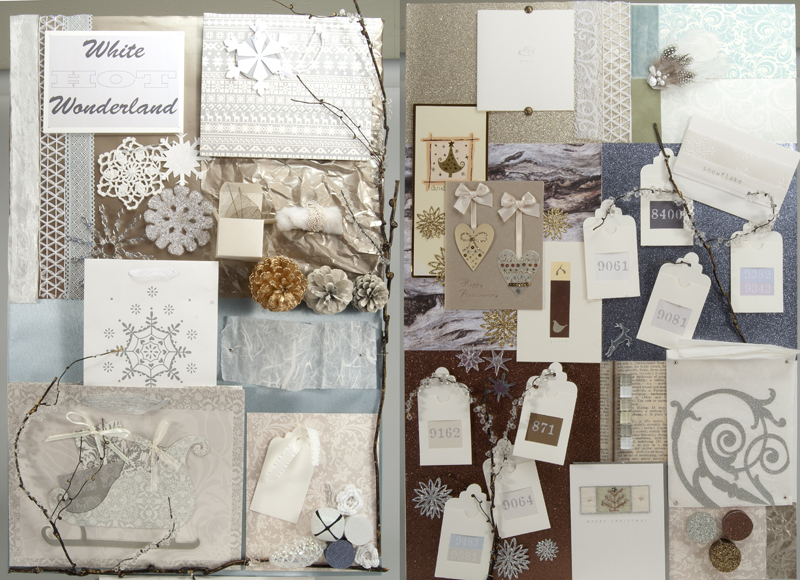 But I DO SO love colour and this colour board definitely has a lot of it! Ahhhh...now I start to get a bit more excited! Traditional Christmas colours of red and green NEVER get old for me. The fresher shades of Avo and Berry instead of standard red and green, give this theme an updated look that I just love. It's also, to quote "a nod to the ever popular handmade movement and it's historical and ethnic influences", Festive Folk is just the right amount of bright sunny colours for a South African Christmas with a healthy dollop of Shweshwe thrown in! Lastly, from the Beyond the Gromet site, we have St Moritz. 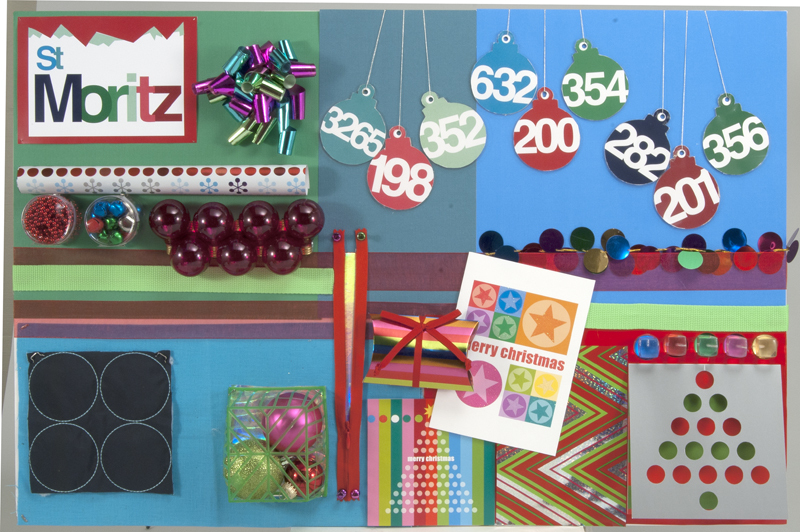 If your Christmas involves a rowdy houseful of children, then you'll love all these bright and cheerful colours. You certainly aren't limited with gift wrap choice and your Christmas packages will be riot of colour! So whilst I do love colour and those colour boards are very pretty, what was missing for me, was something completely fresh and different! I like my Christmases to look like they have a specific theme and if 'the world is your Oyster' with those lovely colour palettes, then in my opinion, a specific theme just doesn't come across. First up, without any fancy name, is Black and White with a Splash of Colour! I just love the bold statement that Black and White makes. Combine gorgeous damask gift wrap designs onto solid black gift wrap, silver gift wrap or white gift wrap. With a plain black and white base of stripes, dots or patterned paper, you can combine pretty much ANY ribbon for a splash of colour. I just love the Fern Green ribbon in the bottom right picture. I also love the splash of pink on the Christmas table setting second picture from the left at the top. Your Christmas theme will be very obvious and very different and all the gorgeous array of ribbon colours will give you just the right amount of South African Christmas Splash! There is an abundance of Black and White decor available at the moment and taking the trend from fashion, black and white stripes are so 'hot' right now! My second Christmas Gift Wrap Theme for 2013 is Navy Blue and Red! Yet again, taking my inspiration from fashion, navy blues, golds, whites, reds create a super elegant effect for a very glamorous Christmas table setting. Tie pretty navy and gold Christmas baubles into your ribbons on your gift. I love the Navy and White striped ribbon with the blingy gold jewellery attachment. Cool, sophisticated and elegant, Navy Blue and Red is a winner for me for Christmas 2013 as well. 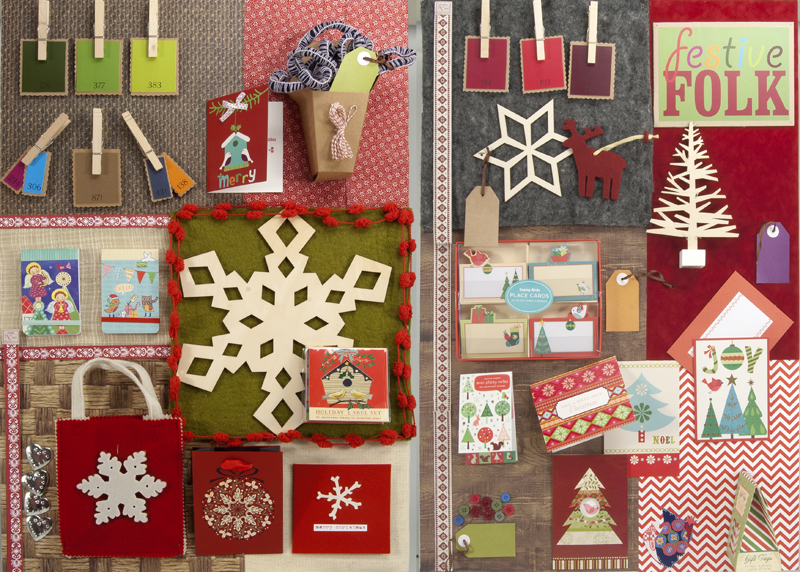 So whilst you're out and about, with Christmas shopping hovering in the back of your mind, start searching for accessories to enhance your Christmas packaging. Decide on your Christmas theme upfront and hopefully, with the lovely colour boards above, I've managed to inspire you and give you some direction with regard to the look you're going for this year.